It used to be called the south pointing fish. During midsummer, the radical leaves of the compass plant invariably point precisely north and south. The rings of a tree are always farther apart on the tree's southern side. Woodsmen often read tree rings to find the compass points. 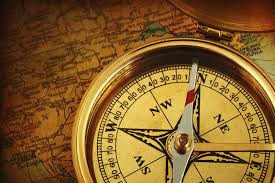 The first person recorded to have used the compass as a navigational aid was Zheng He (1371-1435), from the Yunnan province in China, who made seven ocean voyages between 1405 and 1433. Honeybees navigate using the Sun as a compass, even when it is hidden behind clouds - they find it via the polarization of ultraviolet light from areas of blue sky. Women navigate by landmarks and visual memories. Men navigate by direction and distance, and tend to be better at reading maps. The circle part of a dry compass is heaven, while the plate is earth. The compass rose is a complex figure that displays the cardinal directions and as many as 28 other directions in between. The cardinal directions are North, South, East, and West. Before people used it for navigation, they used it for fortune telling. Sailors in ancient times charted their course by the stars, and did not use a compass. No one knows where or when the first compass was invented. It may have been in China or in the Near East or in Italy. According to Aristotle, wind direction determined whether a baby would be a boy or a girl. The Pole of Inaccessibility is the point on the continent of Antarctica that is farthest in all directions from the seas surrounding it. The term is sometimes used to refer to the point in the Arctic Ocean that is equal distances from the landmasses surrounding it. For many centuries, sailors magnetized compass needles by rubbing them with a lodestone, a magnetite rock. Ships would carry a lodestone to remagnetize the needle. The magnetic compass is an old Chinese invention, probably first made in China during the Qin dynasty (221-206 B.C.). Chinese fortune tellers used lodestones (a mineral composed of an iron oxide which aligns itself in a north-south direction) to construct their fortune telling boards.